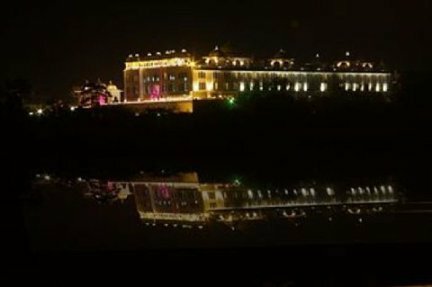 Located at a distance of 27 kilometers from the airport and 7 kilometres from the railway/bus station, Sheraton Udaipur Palace Resort and Spa is situated at Ambamata near Fateh Sagar Lake in the beautiful City of Lakes, Udaipur. Situated on the banks of a splendid view, Sheraton Udaipur Palace Resort and Spa is a premier 5 star hotel offering world class amenities and services along with a plush experience. Sheraton Udaipur Palace Resort and Spa boasts of well equipped and furnished 240 spacious rooms categorized into Superior, Deluxe, Club and Suites with scenic views. All the rooms are designed in a contemporary Indian style. Spread over 33.3-square-metres, the Superior guest rooms at Sheraton Udaipur Palace Resort & Spa reflects a contemporary, warm style and classic Rajasthani charm, with state-of-the-art technology and amenities. Decorated in soothing neutral hues, the rooms offer sweeping views of the sparkling pool or beautifully landscaped garden. The rooms are generous in size and offer top-notch amenities, including a 37-inch LCD TV, plush single-seater sofa, business desk, and refreshment centre. Tastefully decorated with distinct Rajasthani features and timber floorboards, the 33.3-square-metre Deluxe guest rooms offer stunning views of the beautiful Aravali mountain range and the tranquil Fateh Sagar Lake. These spacious, contemporary rooms are well-appointed with a refreshment centre, comfortable business desk, and ergonomic desk chair. Admire the view from the plush one-seater sofa, and enjoy great entertainment on the 37-inch LCD TV. A walk-in closet provides ample room for storage of clothing, luggage or souvenirs. Exclusively found in the Club Wing, the 37 to 50-square-metre Sheraton Club Rooms offer spectacular views of either the tranquil pool, lush garden, Aravali mountain range or nearby Fateh Sagar Lake. With lovely contemporary decor and sparking marble bathrooms plus upgraded amenities and services such as complimentary bottled water, complimentary dry cleaning, and a daily newspaper, Club rooms offer a wonderful alternative for discriminating travellers. Invitingly decorated with authentic Rajasthani accents, rich marble and indigenous fabrics, the 66 to 70-square-metre Suites offer great sophistication and pampering amenities, plus panoramic views of the deep blue Fateh Sagar Lake. Large windows also encompass vistas of the Aravali mountain range, the resort’s lovely garden, and Monsoon Palace. In addition to a master bedroom and bathroom, the Suites feature a separate stylish living area with a comfortable couch and chairs that invite relaxation or socialising, plus a soothing blend of chic modern decor and regional flair as seen in antique accents. The innovative restaurants and bars at the Sheraton Udaipur Palace Resort & Spa serve a wide variety of international and Indian cuisine, with uplifting decor, warm hospitality and five-star service. Antara is an all-day dining establishment with Mediterranean and Indian cuisine and enticing buffets for breakfast, lunch and dinner (open between 7 am – 11 pm). Try Rudra, for delicious vegetarian Indian creations, specialising in Rajasthani Thalis. The hotel offers five unique, multi-purpose conference rooms, ranging from small, elegant boardrooms to the spacious Grand Ballroom, the largest in Rajasthan state, accommodating conference seating for 450 guests or a gala dinner set-up for 1,000. A full range of state-of-the-art audiovisual and production services, a professional business centre, and a dedicated Executive Meeting Specialist ensure that every event is a resounding success. Experience Rajput royalities at “Le Meridien Jaipur” and the Venice of the East, “Sheraton Udaipur Palace Resort & Spa” as never before. Enjoy exclusive benifits for stays until 14th August 2011. If you have not decided yet or wants to customize tour itinerary or hotels listed above in "2 Nights 5 Star Hotel Sheraton Udaipur Palace Package in Rs.7999/-", then we can change the travel itinerary and make a personalized, tailor-made holiday package, especially for you. We can modify this travel package as per your itinerary, budget, duration and the tourist places you would like to visit, including transportation and airfare should be included or not. Please fill the form below to contact us.